When David Foster took a trip to the Amazon last fall, he was excited to explore the jungles and sail to the island beaches off the coasts. The thought never crossed his mind then that he’d save someone’s life there — until he saw Negrita. 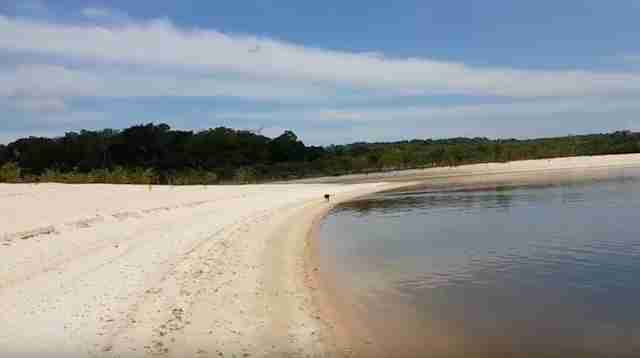 The island was practically deserted, aside from a few people who’d arrived in another boat. Foster called the dog over, hoping to see if she belonged to the other group. 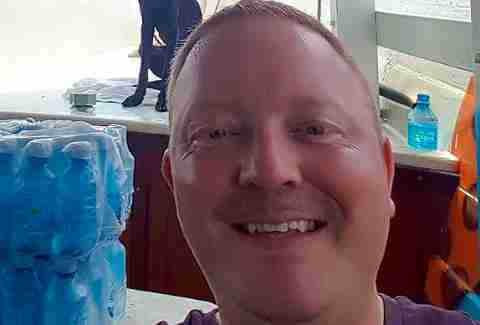 The dog was covered in fleas and ticks, and her ears were sliced open and bloody. Her black fur was thin and patchy — and her bald spots revealed bruises all across her skeletal body. She was so gaunt, in fact, that Foster noticed vultures circling around the skies above her. Given the dog’s location, it was clear she didn’t end up there on her own — and Foster knew it was up to him to get her out. 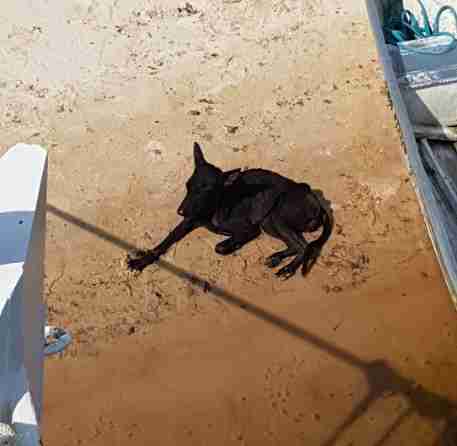 Foster gave Negrita some food and took her into the boat to get her ready for the next wave of the trip. Although she was so thin and beaten up, she looked relieved. 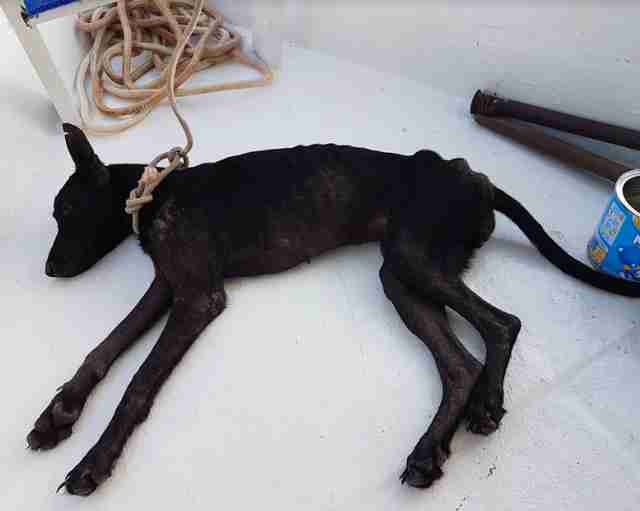 Negrita and her rescuers sailed to the nearest city to search for a vet, and they were luckily able to find one who could provide a bit of help. She was treated for her fleas and ticks and had her wounds cleaned. Luckily, she wasn’t suffering from any broken bones or major muscular trauma. 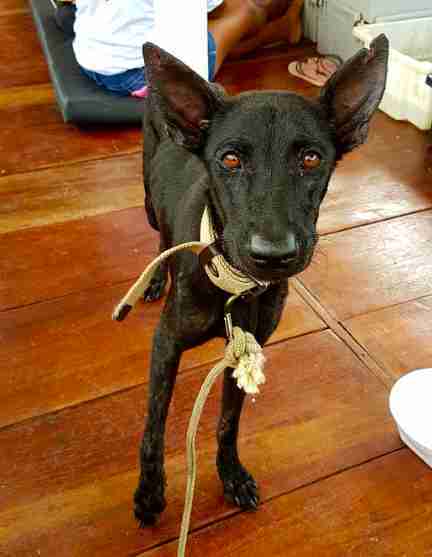 Although Negrita was still quite weak, her sweet and gentle personality shone through more and more each day as she gained back her strength. She followed Foster around the boat constantly, and was always wagging her tail at him. After about four days of caring for her, Foster had made up his mind: He was going to bring Negrita home to the UK. At home, Foster operates PlayforStrays, a charity that brings donated toys to abandoned shelter pets across the world. He had recently traveled to Natureza em Forma, a shelter in São Paulo, Brazil, to deliver toys — and had a feeling they might be able to now help him. 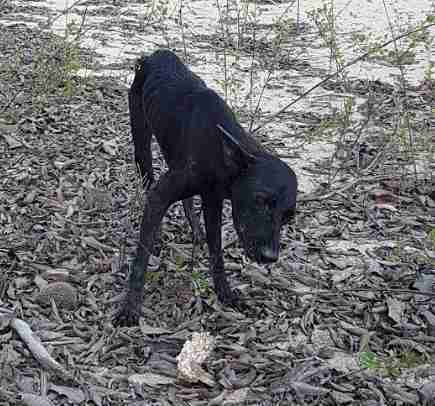 He connected with a generous woman there named Tamis, who right away agreed to foster Negrita as she continued to gain weight and get healthier. 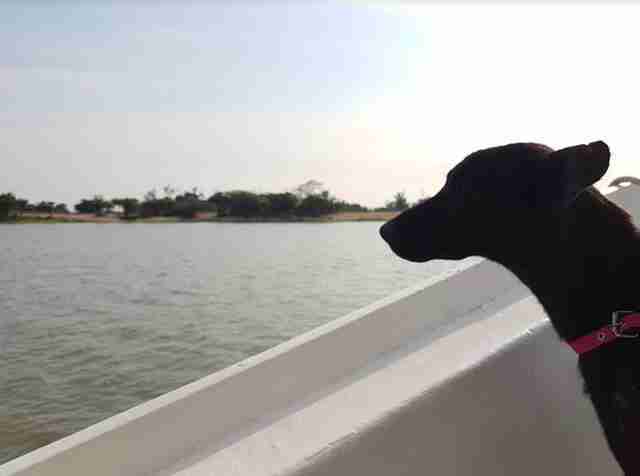 Hundreds of PlayforStrays supporters began sending donations for Negrita’s care and her eventual plane ticket home. Another Brazilian animal rescue group, Canto da Terra, also pitched in and donated all the food Negrita would need at her new foster home. 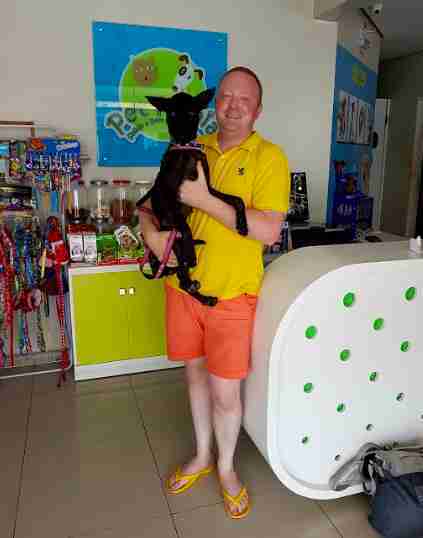 Knowing Negrita was safe and doing well in her temporary home, Foster headed back to Northern Ireland, expecting his new family member to be soon behind in a few weeks. The strict regulations on flying animals internationally, however, created a roadblock. 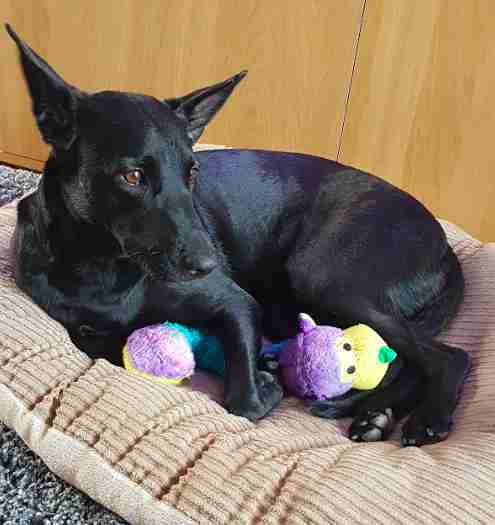 After many months of waiting, Negrita’s homecoming came at the end of March. After several long flights and pit stops, she was finally back with Foster again — who couldn’t have been more relieved to have his “Amazon girl” back. While Negrita was naturally a bit scared during her transition, she’s since settled in wonderfully as a member of the family. Her toys have been a major help in making her feel comfortable, to her dad’s joy. 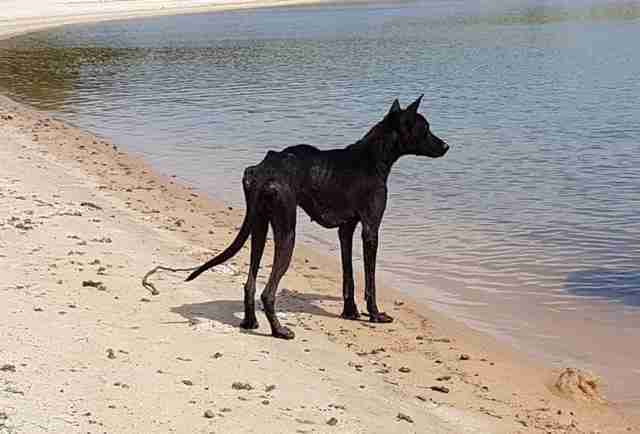 Negrita is learning new things every day — and is now almost unrecognizable from the starving, helpless dog who wandered into Foster’s path seven months ago. Although Negrita’s former life is becoming a distant memory for her, Foster can’t help but think back on it every day. 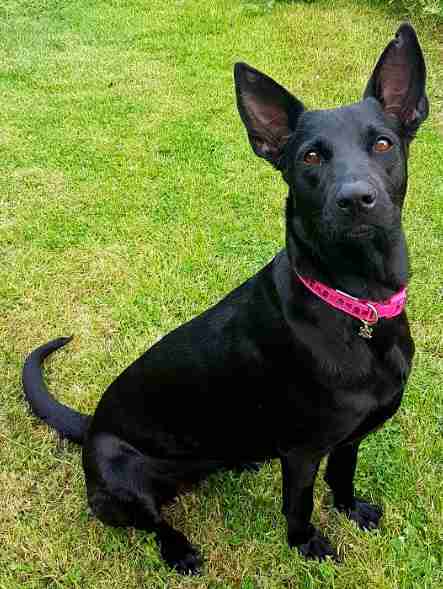 To help bring joy to more dogs like Negrita, you can make a donation to PlayforStrays.